Not only are these little tasty meaty pillows fun to eat, but they are quite simple to put together. Well, truth be told, although a smooth process of assembly, they are a bit time consuming. One hour and a half start to table, but, I’m here to tell you they are worth it. 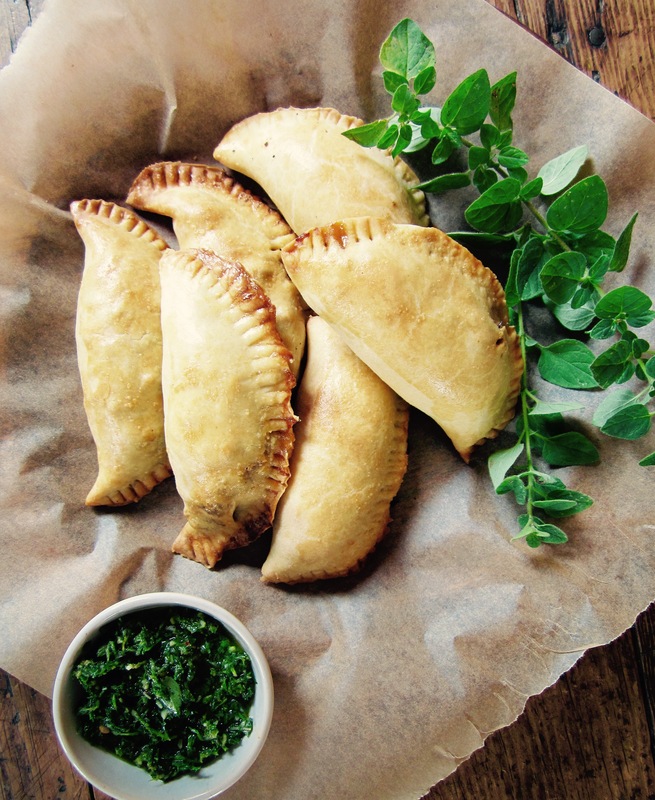 If you have a little extra time and would like to spend it in the kitchen, I recommend making empanadas. I love a good cooking project and this one in particular is very relaxing and unhurried. The pliable dough was a joy to work with, especially with the folding and crimping of the edges. Oh, and the delightful aroma of the beefy filling will spread through your home and create considerably above normal anticipation for dinnertime. No doubt you’ll enjoy spooning a bit of chimichurri sauce onto each bite. First, make the dough and refrigerate while preparing the filling. Mix the flour & salt in a food processor, add the butter and blend well. Add the egg yolk and milk, in small amounts, pulsing until small dough clump forms. Make two flattened disks, wrap in plastic wrap and refrigerate until filling is ready, at least 30 minutes. Melt the butter in a large sauté pan. Add onions and salt, cook until soft, about 10 minutes. Add the beef and break apart with a wooden spoon, cook until browned. Add spices and combine well. Remove from heat and allow to cool. Once cooled add scallions and fresh oregano. On a lightly floured surface thinly roll out the dough and cut out disc shapes. If you don’t own a disc cutter (like me) you may use a small plate or bowl. To assemble the empanadas, add a large spoonful of beef in the center of each disc. Brush the edges of the disc with egg whites. Fold empanada disc and seal the edges gently with your fingers. Use a fork to seal the edges. Lightly brush the top of the empanadas with egg whites and refrigerate for 30 minutes, while pre-heating the oven to 400°F. Bake for approximately 25 minutes. Serve warm with chimichurri sauce. Combine all ingredients in a blender or food processor until smooth. Taste and adjust by adding more vinegar or chili powder, according to your preference. These look delicious. So much flavor in your recipe. I love empandaa and can eat way too many of them, love these with the chimichurri. GREAT photos Seana! I love any kind of meaty pillow, but empanadas are my absolute fave. Have been meaning to share my own recipe for yonks. Yours look beautiful with that perfect golden pastry, and I’m guessing your boys wolfed them down! Have never made my own chimichurri sauce, but yours looks so yum and doable (love a recipe where everything is thrown into a blender). It’s 6.30am here, wish I had a batch of these ready-made for brekkie! Hi Sas! I love them too and hope you share your recipe, I’d love to try it. And you’re right the three of us wolfed them down…yes, I kept up with them! :) If you like your chimichurri a little more rustic (meaning a bit more coarsely chopped) I read you can mix the oil in by hand rather than whizz it in the blender. I’m going to try that next time. I could eat these for breakfast for sure! I was wondering how to make chimichurri sauce. Thanks for posting! Don’t you love chimichurri sauce? I love it with all sorts of cooked fish, chicken or beef, but then I’m a real “sauce person”. Thanks for stopping in!! Enjoy your weekend. Have always wanted to make empanadas. Great Sonal! Would love to see your post if you embark on the empanada project. :) Next time vegetable style…potatoes for sure, and maybe mushrooms? What do you have in mind? Yum these would be fabulous for dinner. I love little bites like this with a glass of wine and a salad for cool nights like we are having here in Tennessee. Thanks for the easy recipe. YES! These look amazing! To be honest I’ve always put off making these because I just assumed they would be a lot harder… now I guess I have no excuse really :) Thank you for sharing! HI Seana– these could be the new take on football watching food!! I think Larry would love them with a beer! They seem delicious and so “eater friendly!” thanks. I thought the same Rhonda, I didn’t picture the beer with it, but now that you mention it…definitely! I’m looking forward to making these with chicken and also a veggie of some sort. Our team is playing Monday night this week…Go Hawks!! Oh, you’ve got a great team to root for! We are Cal Berkeley fans and they are doing well for the first year in a lot time!! How is school going? Hope it’s a good week ahead, Seana. I have never actually had empanadas but love all the flavorings in these and that awesome chimichurri sauce. They look easy to make too. Yum! Love it. Should try it soon!! I have not seen you in the reader or I have just missed you! so, I ran past, love these and I pinned them!! When this email came through I got excited that you were making pastry (should I get excited about that? Yes.). But the link was page not found. Anyway, you certainly seem to be coping well with differing pastries. 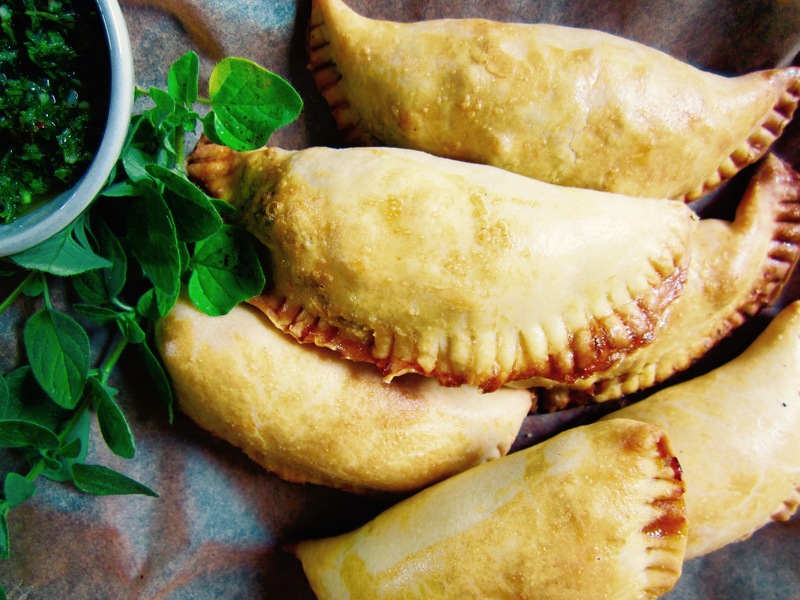 And the empanadas look great in the photos. Pastry making can be such a challenge. But with a little experience I’m really beginning to enjoy it. Although that’s only a recent thing. You know what made a difference with my pasty making? My sister came for a visit and insisted on purchasing a food processor for my kitchen. And voila! The pastry turns out beautifully every time. I think my hands are too warm to make it by hand. I read that once. If your hands are warm your pastry will fail. :/ Is it cheating using a food processor? Living over 40 years in California (close to Mexico) I first learned of empanadas when I was visiting Bueno Aires. It was love at first bite. It brought back the memories of piroshikis my father made, Next time, I am certain that I am going to use your recipe. Yum! You are currently reading empanadas at COTTAGE GROVE HOUSE.